The pitching staff is highlighted by Scott, who spent all of 2014 in Portland and went 8-2 with 3 saves and a 1.96 ERA in 34 relief appearances (1 start) en route to being named a 2014 Eastern League mid-season All-Star. The Sea Dogs also return Mike Augliera, who led the staff in innings pitched (148.0) and games started (24) and went 8-10 with a 4.56 ERA while posting and Eastern League-best 1.23 BB/9.0 IP. Justin Haley will also be returning to Portland after finishing the 2014 season with the 2nd best ERA (2.35) among Red Sox farmhands. The 6'5" righty made 6 starts for the Sea Dogs after being called up in late July from Salem (A+), where he was a Carolina League mid-season All-Star. The staff will also feature Pat Light, the #30 ranked prospect in the Red Sox system according to Baseball America. Light led the Salem Red Sox (A+) in both games started (22) and innings pitched (115.0). Jonathan Aro will be making his Double-A debut after spending 2014 in Greenville and Salem. Aro was named a South Atlantic League mid-season All-Star as well as the Red Sox Minor League Relief Pitcher of the Month for April. Former 7th round pick Madison Younginer will be making his regular season Double-A debut after making one appearance for the Sea Dogs in the playoffs last year. In 2014 he led Salem in appearances (T-35) and holds (7), and was rated by Baseball America as having the best breaking pitch in the Carolina League. Five of the six infielders on the Sea Dogs roster were originally drafted by the Red Sox, including Carlos Asuaje, an 11th round pick in 2011 and #25 prospect in the Red Sox system, according to Baseball America. Playing for both Greenville (39 G) and Salem (90 G) in 2014, Asuaje ranked among Red Sox organizational leaders in triples (12-1st), extra-base hits (65-1st), slugging % (.533-1st), runs batted in (101-1st), home runs (15, 4th) and batting average (.310-5th). Asuaje was also named a mid and post-season South Atlantic League All-Star. Jantzen Witte will be making his Sea Dogs debut in 2015 after leading the Red Sox minor league system in hits (153) and doubles (44). Witte split his time evenly in 2014, playing 65 games each at both Greenville and Salem. David Chester and Mike Miller will be back in Portland after both made their Double-A debuts in 2014, while Reed Gragnani will be making his first appearance in Portland after spending the entire 2014 season in Salem, where he hit .300 in 99 G. Marco Hernandez rounds out the Sea Dogs' infield. The 22-year-old Dominican shortstop was acquired in December of 2014 as the player to be named later in the trade that sent Felix Doubront to the Chicago Cubs. Hernandez spent all of 2014 in Daytona (A+) and led the team in triples (7) and stolen bases (22) and was named a Florida State League mid-season All-Star. 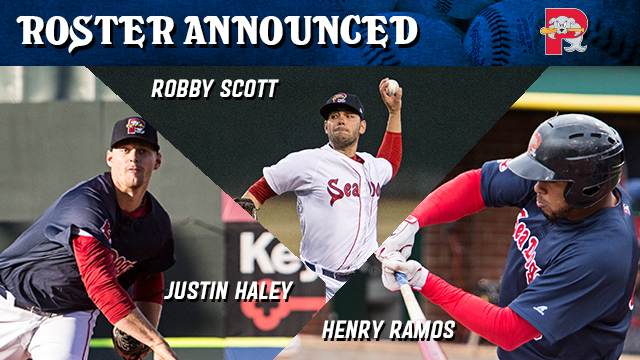 The Sea Dogs' outfield will feature several familiar faces, as four of the five players on the roster saw action in Portland in 2014. Keury De La Cruz is back in Portland after a 2014 campaign where he hit .295 in 70 G as a Sea Dog. Henry Ramos will be looking to rebound after a 2014 season that ended prematurely when he fouled a ball off of his right leg and suffered a fractured tibia just 48 games into the season. At the time of his injury, Ramos was hitting .326 with 2 HR, 23 RBI, 9 2B, and 2 3B. The #29 ranked prospect in the Red Sox system according to Baseball America, Ramos is also rated as having the best outfield arm in the system. Jonathan Roof will be back in a Sea Dogs uniform after appearing in 59 games for Portland in 2014, as well as Kevin Heller, who played 10 games for Portland after being promoted from Salem (A+) in mid-August. In Salem, Heller was named a Carolina League mid-Season All-Star. Newcomer Blake Tekotte, a former 3rd round pick of the San Diego Padres, rounds out the outfield. Tekotte was signed by the Red Sox as a minor league free agent in January of 2015 after spending the 2014 season with two different Triple-A clubs: Charlotte (Chicago White Sox) and Reno (Arizona Diamondbacks). Luis Martinez leads a trio of catchers for Portland. Last year, Martinez hit .242 in 67 games combined between Salt Lake (AAA-Los Angeles Angels) and Sacramento (AAA-Oakland A's). He was signed by the Red Sox as a minor league free agent in January of 2015. Michael Brenly will also be back behind the plate for Portland after spending the 2014 season as the primary backup catcher to Blake Swihart, catching 32 games (2nd most on the club). Brenly threw out and impressive 16 of 31 (51.6%) attempted base stealers and also proved to be a versatile defender, seeing action at first base (6 G), third base (2 G), and left field (3 G). Brenly is the son of former major league player and manager Bob Brenly. Tim Roberson will be making his Double-A debut this season after spending 2014 playing for Greenville (A) and Salem (A+). The 25-year-old catcher was signed by the Red Sox as a non-drafted free agent in June of 2011. The 2015 roster features 13 players originally drafted by the Red Sox, 11 players who were signed as free agents, one acquired by trade, and one selected in the Rule 5 Draft. 23 of the 26 players spent the 2014 season playing in the Red Sox system, with the only exceptions being Marco Hernandez (Daytona), Blake Tekotte (Charlotte/Reno), and Luis Martinez (Salt Lake/Sacramento). Billy McMillon will be back for his second season as Sea Dogs manager after leading Portland to a franchise record 88 wins in 2014 and being named the Eastern League Manager of the Year. McMillon played for the Sea Dogs in 1995 and still holds the franchise record for walks in a single season with 96. The field staff also includes Pitching Coach Kevin Walker, who replaces Bob Kipper (now in Pawtucket), and Hitting Coach Dave Joppie (replacing Rich Gedman, also in Pawtucket), who joins Portland for his sixth season overall as Hitting Coach (most recently in 2012), having spent 2013 and 2014 in the same role for Pawtucket. The Sea Dogs also added Joe Thurston to the field staff as a Coach. Thurston played 184 games over seven major league seasons with the Dodgers, Phillies, Red Sox, Cardinals, and Marlins, and spent the entire 2014 season playing in the Mexican League, where he hit .274 in 95 games. Tickets are available for Opening Day as well as all 2015 home games. Tickets can be purchased by calling the Sea Dogs ticket office at 207-879-9500 or online at www.seadogs.com. Book you nine-inning vacation today!